Behind the cups of coffee poured at such places as Finch’s Brasserie, Lennie’s, and Bloomington Bagel Company, there is a Bloomington man and his coffee roasting company. In a small industrial building south of downtown, S.K. Quigley, owner of Partridge & Quigley Coffee Roasting Company, turns raw green coffee beans from far away places like Colombia and Costa Rica into dark aromatic beans that are brewed and sold locally. Shoppers can also buy bags of Quigley’s roasted beans at Bloomingfoods Market and Deli, some Kroger stores, and O’Malia’s in Bloomington, as well as a few select stores in Indianapolis and Nashville, Indiana. 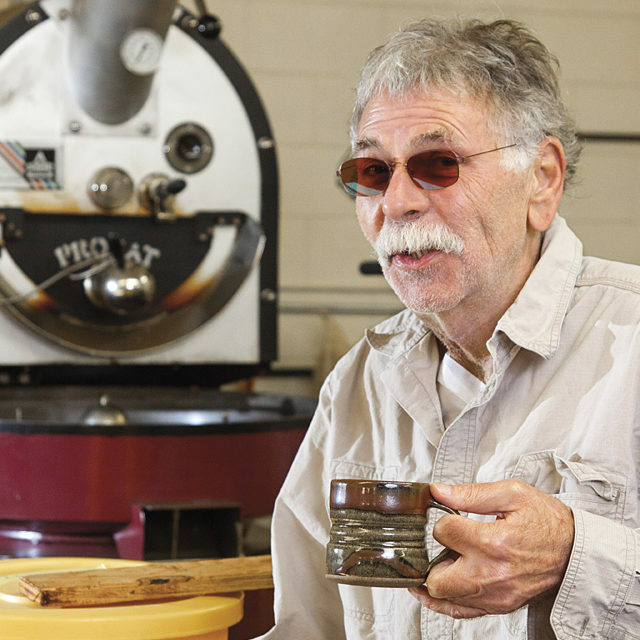 Quigley has been roasting since the ’70s and has operated his own micro-roasting company for more than 25 years, first in Indianapolis. His approach is to start with high-quality raw beans, then roast simply and deliver fresh. He buys green beans in small batches from Theta Ridge Coffee, a bean broker in South Bend. Using a manual machine, he roasts in small, 25- to 30-pound batches, cools them naturally, then tucks the beans into brown bags. They are delivered to businesses within one to two days of being roasted. Best-selling varieties include an earthy and rich Sumatran Mandheling, a medium-bodied Colombian Supremo, and a combination of the two, called Proprietor’s Choice Blend. Quigley also offers organic options and a few flavored blends, as well as decaffeinated coffee. Partridge & Quigley is a one-man operation. Quigley, a tall, low-key man who takes his coffee black, does the roasting, bookkeeping, and delivering to businesses. He works without a cell phone or computer. On the side, he’s an artist who creates mixed-media pieces out of ceramic, copper, and wood. Partridge & Quigley coffee is found at fewer than 20 restaurants and grocery stores, a small group that allows him to interact with each client.